Struggling to live the life less expensive. Two children, too little money. Hexagon, a photo by tatiacamilla on Flickr. And a number between "some" and "many" to go. Officially it's a quilt for Nicholas, born on Easter Sunday and so all of three months old. If he's lucky, he'll get it before he goes to university. To keep it unified, I'm only using shwe shwe fabrics from here, and the vast majority will be plain blue. The plan, such as it is, is to keep making diamonds and sewing them into larger hexagons until I run out of fabric, then decide how bored I am and how big I want it to be. I may tessellate the hexagons with squares and triangles, I may not. 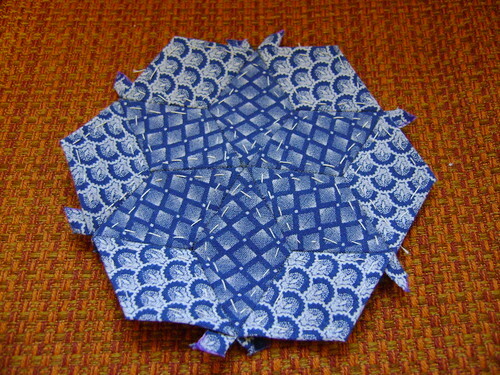 One hexagon takes an evening to sew (and a preceding evening tacking fabric onto papers, saying thank goodness for the invention of pre-cut papers). It's going to take a while. He spends an awful lot of time smiling, and laughing, and cooing. 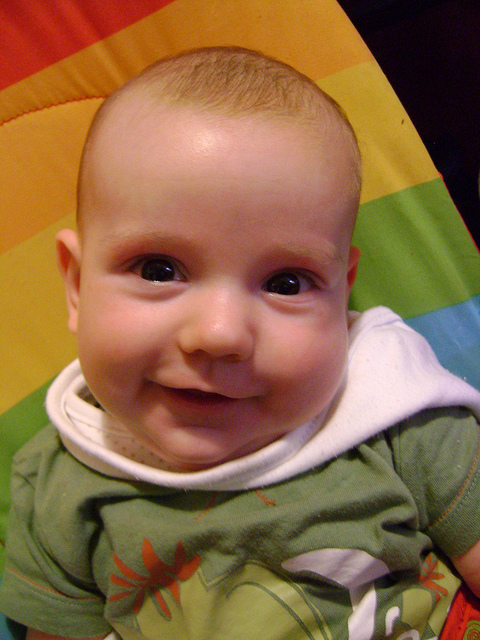 It's strange and disconcerting having a happy baby.